Here’s the Photowebo Black Friday deals for photographers – a round up of all the Black Friday, Cyber Monday, and related holiday coupons and offers being made for photography services and other companies related to running a successful modern photography business. Black Friday / Cyber Monday have passed, but I’m leaving this page up as some offers are still in effect. My recommended domain registrar, NameCheap, offers deals changing hourly on Black Friday and Cyber Monday. SiteGround: up to 70% off on shared hosting. Hit this link for the deal. 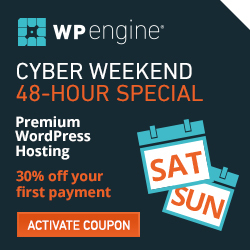 WP Engine: 30% off your first payment – this means about 5 Months Free on a new annual plan. Use this link for the deal and use code CYBERWPE. SmugMug is offering 40% off all new accounts through Monday the 30th – no coupon necessary. Zenfolio is offering a 25% discount on new accounts with coupon code ZENHOLIDAYS25 – hit this link or the banner below to redeem. NextGEN gallery system for WordPress is 40% off. FooPlugins isn’t doing a sale at all – and here’s why. Photography Spark has three of their popular products on sale – all are great business tools for photographers. Deals end December 1st. CyberChimps are WordPress repsonsive theme pioneers, with over 11 million websites using their themes. They’re offering a 30% discount on all plans using code CYBERF30 through December 5th. Photocrati Theme for photographers is 40% off – now only $47 – using this link (no coupon code required). 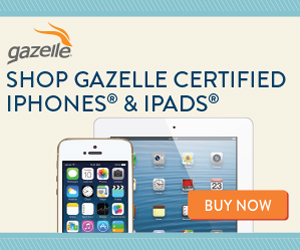 Gazelle has a ton of reconditioned gear, great for gifts or as a gift for yourself. Check out the cerfitifed iPhones and iPads and note they’re offering 10% off everything through Monday November 30th. Black Friday through Cyber Monday Deals for Photographers: https://t.co/EdZBbAFVPR updated as things change with new offers. Some of the links above are affiliate links; your clicks and purchases help to support Photowebo.